What is Christmas without cranberries? I have bags of them in my fridge right now, waiting to be transformed into a variety of concoctions to be consumed over the holiday season. Yum! They are going to find their way into stuffings, salads, mustards, sauces, cookies, Christmas puddings, cakes, and of course, the subject of today’s post, chutneys. 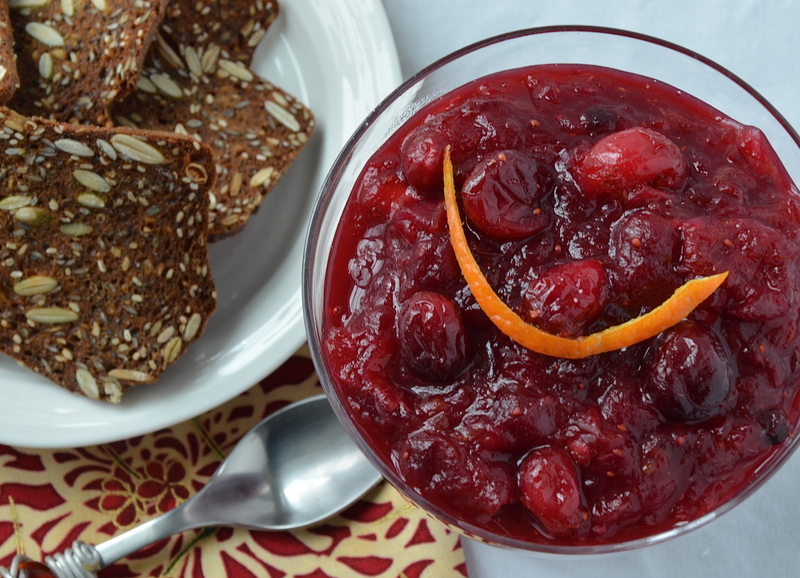 My mom reminded me gently the other day that I had not posted a recipe for the cranberry chutney I had alluded to in my December Turkey Burger recipe – thank goodness for moms! So, I pulled out a recipe from one of my fave food magazines and cooked it up, believing it was something I had made before! Wrong! It went directly into the garbage can. I was so sure I had already made it and loved it, but it was really bad – far too acidic – so much so that it burned on the way down the throat. Yuck! The next morning I woke up with ideas for a kinder, gentler chutney – all of the complementary flavours dancing around in my brain. So here is my own version of cranberry chutney. I guess that there must be endless possibilities for chutney ingredients, but I will make this one again as my husband has been devouring it with sharp cheese and the lovely crackers in the photograph. No worries, it is quick to make and the whole house smells divine while you are cooking it. You can serve this with your turkey on Christmas Day or serve it with some sharp cheese and baguette or crackers. It would also be amazing on a turkey or chicken sandwich, mixed with some mayonnaise. Reduce heat to low and simmer, gently for 30 – 35 minutes until the berries are cooked and the mixture has thickened to a chutney-like consistency. Gently mash some of the cranberries with the side of a spatula, keeping some whole for a bit of texture. Will keep in the refrigerator for up to 3 weeks.